Excellent for robotics and experimenter applications! 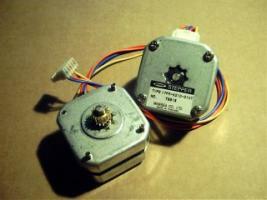 These motors are new old stock: Two-phase, 12-Volt operation, w/ 1.8 Degree steps. The motors are made by Minebea Co. These are very similar to motors used in (older) disk drives, automated turntables, automated instrumentation etc. They have good torque and holding characteristics and would make terrific prime movers for robotics and other similar automation projects.